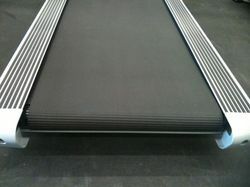 Our product range includes a wide range of treadmill belts and treadmill conveyor belts. We Sri Dharshini Enterprise provide the best quality of treadmill belt, for comfort running and long life of the belt. Size of the belts are customised accourding to the need of the customers. Since the day of our inception, we have been successfully manufacturing, supplying, trading and distributing an exclusive range of Treadmill Conveyor Belts. Precisely designed, these belts are made using premium-grade material and modern technology to ensure that final output meets with international quality norms. Furthermore, our belts are available in various lengths and thickness at market leading prices. We are one of the leading manufacturer of wide range of Treadmill Conveyor belt in Coimbatore, Tirupur, Pollachi, Ooty, Salem, Erode, Karur, Madurai, Dindigul, Theni, Thirunelveli, Thoothukudi, Perambalur, Ariyalur, Dharmapuri, Hosur, Vellore, Krishnagiri, Kanchipuram, Pandichery, Chennai, Palakkad, Thrissur, Ernakulam Thiruvananthapuram, Idukki, Chochin, Kannur, Allepy, Malabar, Kozhikode, Kottaiyam, Kerala, visakapattinam, Vijayavada, Hyderabad, Chittoor, Tirupathi, Andhrapradesh, Andra, Telungana, Banglore, Shimoga, Mysore, Karnataka. South India and India.